Bedouins traditionally live a nomadic lifestyle, spreading from the Persian Gulf to the Atlantic Ocean, and from the borders of Turkey to Yemen. The word 'bedouin' comes from the Arab word 'Bedou' that means "desert dweller." Estimates say nomadic Bedouins constitute about one-tenth of the population of the Middle East. Bedouin life is generally pastoral, raising camels, sheep, goats and cattle. They normally migrate seasonally, depending on grazing conditions. In winter, when there is some rain, they migrate deeper into the desert. In the hot, dry summer time, they camp around secure water sources. 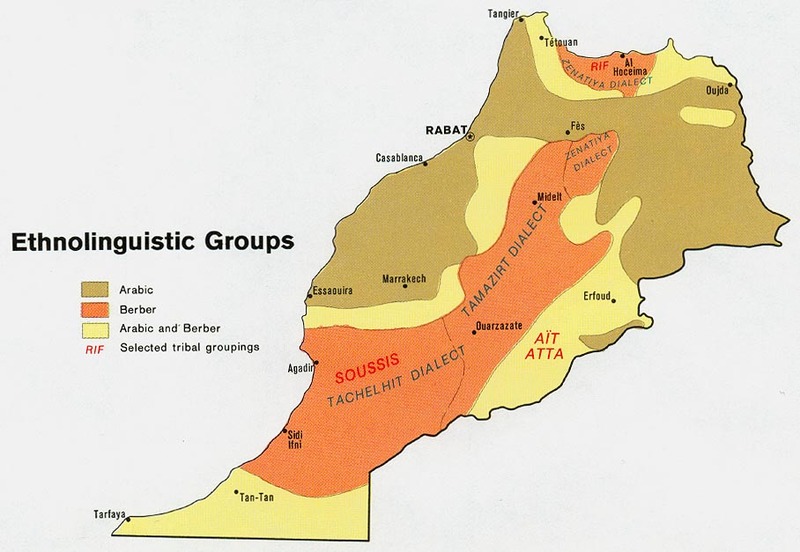 Bedouins define themselves as members of tribes and families. People are divided into social classes, depending on ancestry and profession. Passing from one class to another is relatively feasible, but marriage between a man and a woman of different classes is difficult. Traditionally, the Bedouin's home, the tent, is divided into three sections by curtains: the men's section, the family section and the kitchen. In the men's area, guests are received around the hearth where the host prepares coffee on the fire. This is the center of Bedouin social life. Tea is served as a welcome drink; coffee is usually prepared after the meal and is the last drink before the guest leaves. The serving of food and drink represents the generous hospitality of the host. The men pass the evening trading news and discussing their animals. Separated from them by a curtain, the women gather in the family area and kitchen along with their small children to bake bread and prepare the main meal. A dinner of rice and chunks of mutton or lamb are then served to the gathered guests. 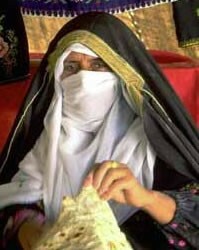 Women occupy a very important position in Bedouin society. Not only do they raise the children, herd the sheep, milk the animals, cook, spin yarn and make the clothes, but they also weave the cloth that constitutes the tent. The Bedouin men gather around the fire, sharing stories and sipping coffee. They might discuss falconry, the saluki greyhound and Arabian stallions, all animals the Bedouins are credited with raising, as well as other matters of importance to the tribe. Traditionally, one of the men recites poetry or sings. To mark the end of the evening, the host burns incense in a mabkhara (incense burner) passing it to each of his guests to inhale and fan their clothes. Poetry has been a central cultural form of expression for the Bedouins throughout their history. In early centuries of Islamic history, Bedouin poetry represented the ideal standard for other literary achievements, as well as for the Arabic language. The traditional foods of the Bedouin are dairy products and meat. Bedouins sell and barter products in order to obtain agricultural food from sedentary peoples. Bedouin society has a strict code of honor which dictates proper behavior for all members, including children. Because of the demanding nature of the Bedouin lifestyle, children are expected to assume a considerable amount of responsibility in order to help their families survive. Although modernization has changed the Bedouin lifestyle somewhat, emphasis is placed on teaching children to carry on traditional ways of life, and the advancement of modern technology is not considered important to children's education. Modern societies have made the traditional Bedouin lifestyle less attractive since as it is demanding and often dangerous. Because of that, many tribes have settled in urban areas. It is not uncommon to see a young Bedouin building a house and living in it; however, his parents will pitch their tent in the garden, where they will live very happily until the end of their days. Governments have a strong tendency to regulate Nomadic lifestyles since it is only then that taxation works. Providing services for the people also works best in an urban setting. Today, the Arab world has one of the highest rates of urbanization in the world. Islam's prophet Mohammed was born and raised in the Bedouin tribe of the Quraish. The Qur'an, first revealed to Mohammed, was later written and compiled in the Arabic language. The first converts to Islam came from the Bedouin tribes living in and around Mecca. Therefore, Islam is embedded and deeply rooted in Bedouin culture. Although there are pockets of Christians in Bedouin tribes, by and large the word Bedouin is synonymous with being a follower of Islam. Prayer is an integral part of Bedouin life. As there are no formal mosques in the desert, they pray where they are, facing Mecca and performing the ritual washing, preferably with water. Since water is not always readily available, they 'wash' with sand instead. In modern Arab states and Israel, Bedouins are faced with challenges in their lifestyle, as their traditional Islamic, tribal culture has begun to mix with western practices. Men are more likely to adjust and interact with the modern cultures, but women are bound by honor and tradition to stay within the family dwelling. They therefore lack opportunity for advancement. Problems facing the Bedouin population of Israel include dispossession and the struggles connected to the Israeli-Palestinian conflict. Some live in townships, while others either live as squatters on land they claim as their own, or in the original 1948 refugee camps. The Bedouins who have Israeli citizenship receive free education and medical services as well as cash benefits for children, something that has attributed to the high birthrate among Bedouins (5% growth per year). Unemployment, on the other hand, is very high, and few obtain a high school degree (4%), and even fewer graduate from college (0.6%). Even though the Bedouin population exceeds 110,000 in the Negev, there are still many physical, social, and spiritual problems. The Bedouins are almost untouched by the gospel. Christian resources are available in the Arabic language, the Bedouin's mother tongue. View Bedouin, Yahia in all countries. 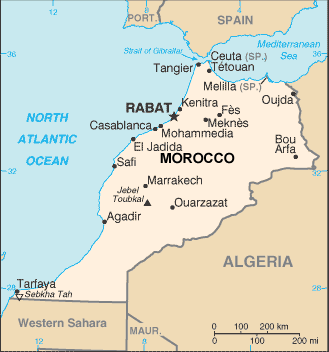 Location in Country: Southern Morocco.